At jazelz you can make your vision come to life and have bespoke outfits created in any colour, fabric, print; with or without embellishment and its all made to measure. First thing first is to book an appointment via our contact us ‘Lets talk dresses’ page.I meet all my clients in the studio and that’s where the jazelz creativity begins. Im going to take you through step by step of Simran’s bespoke Jazelz Flower girl dresses for her wedding. All bespoke outfits have a lead time of 8 weeks from start to finish. Step 1 – The consultation, Simran came to her appointment with ideas of what she wanted and a lace swatch of her dress that was being made and wanted something similar for the Flower Girls. Simrans flower girls were a mix of ages and she wanted them all to have the same fabric but 1 style that complimented the eldest 3 and 1 style for the 2 younger girls. Along with the 5 Flower Girls Simran had 2 Page boys and wanted to tie in the colour scheme in their cravat and pocket square. So with all of that in mind I sketched a few options with Simran and started the process of sourcing the lace for Simrans next appointment. Step 2 – The progess appointment – At this appointment I had the final sketches ready and all the Flower girls were there ready to be measured. 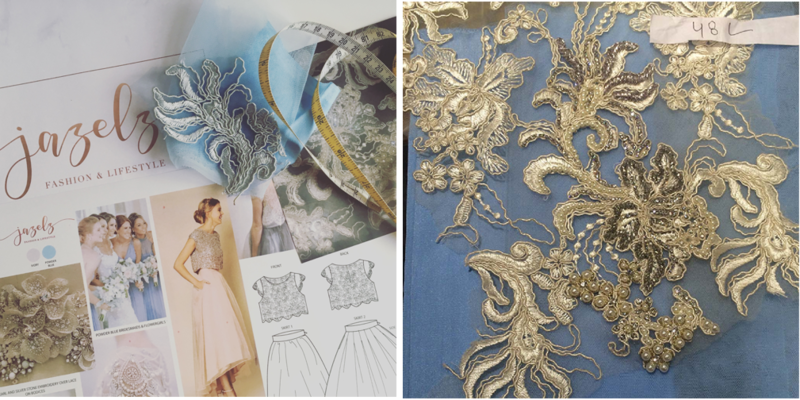 I also had a selection of lace, embellishment and various tones of the powder blue colour swatches for Simran to confirm. All was confirmed and from the styles were all put into work with the factory. Step 3 The Collection appointment – All the Flower Girls and Simran came to try on and collect the outfits, cravats and pocket squares. Simran and all the girls were pleased with their outfits.